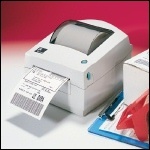 The direct thermal LP 2844 bar code label printer is ideal for applications requiring a space-saving, desktop-size, 4.09" (104 mm) printer. This user-friendly printer delivers optimal performance in today's on-demand desktop labeling applications. The LP 2844 has a sturdy construction with a double-walled ABS casing. Serial, parallel, and USB interfaces, and an optional internal Ethernet (ZebraNet PrintServer II), make this flexible, reliable, and affordable printer a smart investment. Model 2844-20300-0001, 203 DPI, 4 IPS Print Speed, 256KB SRAM, 512KB Flash, Serial, Parallel, USB, US Plug, EPL. Discontinued - Call for replacement. Model 2844-20300-0011, 203 DPI, 4 IPS Print Speed, 512KB SRAM, 1MB Flash, Serial, Parallel, USB, US Plug Language, EPL. Discontinued - Call for replacement. Model 2844-20300-0021, 203 DPI, 4 IPS Print Speed, 256KB SRAM, 512KB Flash, Serial, Parallel, USB, Real Time Clock, US Plug Language, EPL. Discontinued - Call for replacement. Model 2844-20301-0001, 203 DPI, 4 IPS Print Speed, 256KB SRAM, 512KB Flash, Dispenser, Serial, Parallel, USB, US Plug Language, EPL. Discontinued - Call for replacement. Model 2844-20301-0011, 203 DPI, 4 IPS Print Speed, 512KB SRAM, 1MB Flash, Dispenser, Serial, Parallel, USB, US Plug Language, EPL. Discontinued - Call for replacement. Model 2844-20301-0021, 203 DPI, 4 IPS Print Speed, 256KB SRAM, 512KB Flash, Dispenser, Serial, Parallel, USB, Real Time Clock, US Plug Language, EPL. Discontinued - Call for replacement. Model 2844-20301-0031, 203 DPI, 4 IPS Print Speed, 512KB SRAM, 1MB Flash, Dispenser, Serial, Parallel, USB, Real Time Clock, US Plug Language, EPL. Discontinued - Call for replacement. Model 2844-20302-0001, 203 DPI, 4 IPS Print Speed, 256KB SRAM, 512KB Flash, Cutter, Serial, Parallel, USB, US Plug Language, EPL. Discontinued - Call for replacement. Model 2844-20303-0001, 203 DPI, 4 IPS Print Speed, 256KB SRAM, 512KB Flash, Liner free, Serial, Parallel, USB, US Plug Language, EPL. Discontinued - Call for replacement. Model 2844-20307-0001, 203 DPI, 4 IPS Print Speed, 256KB SRAM, 512KB Flash, Liner free, Dispenser, Serial, Parallel, USB, US Plug Language, EPL. Discontinued - Call for replacement. Model 2844-20307-0011, 203 DPI, 4 IPS Print Speed, 512KB SRAM, 1MB Flash, Dispenser, Liner free, Serial, Parallel, USB, US Plug Language, EPL. Discontinued - Call for replacement. Model 2844-20400-0001, 203 DPI, 4 IPS Print Speed, 256KB SRAM, 512KB Flash, Serial, 10Base-T Prt Server, US Plug Language, EPL. Discontinued - Call for replacement.